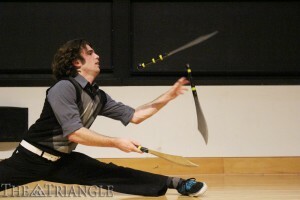 World champion juggler Thom Wall performed Jan. 23 at Drexel’s Mitchell Auditorium. In his 30-minute performance, he showcased his skill and various ball routines, one of which earned him a silver medal at the International Jugglers’ Association 2012 Senior Stage Competitions, making him the second-best juggler worldwide. Wall has been on the road for over three months. He recently returned from South Korea to perform at Drexel, where he is currently an online graduate student. Wall is studying to earn his Master of Science in nonprofit arts administration with an emphasis in digital marketing, strategic planning and event planning. “I’ve come to recognize that the community needs people who are more than just artists but who also have some business wherewithal,” Wall said. His performance was comedic and playful, with his gaze constantly fixed to the balls flying all around his body. The playful smile of enjoyment never left his face despite the audience’s silence — catching on late to a few of his jokes. On top of a wooden spoon in his mouth, he balanced three cups while standing on one foot, five cups while doing push-ups, seven cups while jumping rope, and finally the crowd watched in surprise as he could barely reach his arms high enough to put the final two glasses on top of the balance, making it a stable nine glasses balanced from his mouth. In an act of comedic relief, he then took out a bottle of water and started pouring it into one of the glasses “to prove that these are real cups,” drinking the water himself “to prove I’m not a robot.” Finally, in order “to prove that men can do dishes and clean up after themselves,” he stuffed all of the cups and props into his suitcase and hid it behind the podium. His athleticism was incorporated into his routines as he performed back bends and splits. He was constantly jumping and circling around the stage. The juggler’s worst nightmare, the ball or two that hit the ground, was proceeded by another feat of balancing another ball behind his head while picking up the one that fell and tying it directly back in with his routine. With his music playing in the background, he kept the rhythm of the juggling to the beat of the music and choreographed a series of movements as he skipped across the stage while juggling five, six, seven balls at a time — it was hard to keep count as he kept adding balls. After catching each of the balls, Wall smiled of his accomplishment and asked the audience, “Did you guys enjoy that?” Looking out into the audience and pointing at specific awe-ridden audience members, he exclaimed, “Yes!” in a way that was just as excited as the audience itself. After the show, Wall spent time in the auditorium teaching people how to juggle and showing experienced jugglers how to do some new tricks. 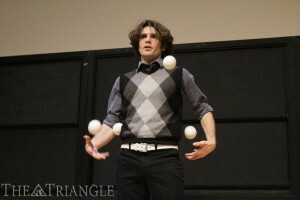 Proudly, he admitted to never having failed at teaching somebody to juggle within a half hour or so. Wall said that the same adrenaline rush that comes from first learning how to juggle is the same feeling that comes every time he learns a new trick, so it’s no wonder why he has juggled as a hobby for 10 years and professionally for three. Also in attendance were multiple members from the Philadelphia Jugglers Club, which meets Mondays from 8-10 p.m. in Lloyd Hall at 1 Boathouse Row. Wall thanked the Drexel Campus Activities Board and Urban Playground for sponsoring the event and inviting him to perform. Audience members went home with their own sets of juggling balls and a newfound source of thrill, excitement and appreciation for the juggling community as a whole.